Another smartphone has been spotted online. 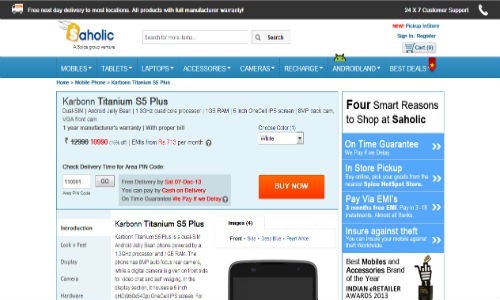 It is none other than Karbonn’s Titanium S5 Plus, which along with 1GB is reported to carry a quad-core processor from MediaTek. A lot of other phones from manufacturers like Micromax have been known to make their way online before being officially launched, and this one seems like another one from the same breed. The device in question thr Titanium S5 Plus is said to sport a quad-core MT6582 clocked at 1.3GHz per core. Along with this low-cost processor, the phone is expected to come with 1GB of RAM and a standard 4GB ROM. The device has been spotted at ecommerce site Saholic, where it is being sold for 10,990 INR. Full specifications of the phone include a 5 inch screen with a qHD resolution of 960 x 540 pixels, a quad-core processor clocked at 1.3GHz, 1GB of RAM, 4GB of ROM with a microSD card for expansion up to 32GB. Imaging is said to be taken care of by an 8MP rear shooter assisted with LED flash and autofocus, and a front VGA unit. The phone is expected to feature an 1800mAh battery and Android v4.2 out of the box. There’s no word on availability yet, but we think it would be safe to assume that the phone will be launched with a week or two.